The initial lineup of screenings set for 2018 American Film Market® (AFM®) was revealed on October 8th. 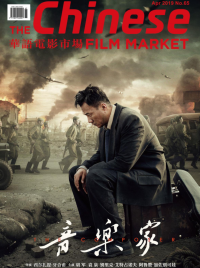 More than 300 films including 64 world premieres will screen over the week for thousands of film buyers and industry professionals from more than 80 countries. Films making their World Premieres include: ASTERIX® THE SECRET OF THE MAGIC POTION, from directors Louis Clichy and Alexandre Astier and starring Christian Clavier, Guillaume Briat, and Elie Semoun (SND Groupe M6); BALLOON, from director Michael Herbig and starring Friedrich Mücke and Karoline Schuch (STUDIOCANAL); BEAUTIFUL DARKNESS, from directors Monty Whitebloom and Andy Delaney and starring Matthew Broderick and Chloe Sevigny (Octane Entertainment); FIDEL UP CLOSE, a documentary from directors Gabriel Beristain, Roberto Chile, and Eduardo ‘Tato’ Flores (Vedado Films); KILLERMAN, from writer/director Malik Bader and starring Liam Hemsworth (The Solution Entertainment Group); KILLERS ANONYMOUS, from writer/director Martin Owen and starring Gary Oldman and Jessica Alba (Fabrication Films); MRS. LOWRY AND SON, from director Adrian Noble and starring Timothy Spall and Vanessa Redgrave (The Exchange); RUNNING WITH THE DEVIL, from writer/director Jason Cabell and starring Nicolas Cage and Laurence Fishburne (Moonstone Entertainment); and STANO from director Raymond De Felitta and starring Joe Manganiello, and Sophia Vergara (Kathy Morgan International (KMI)). Other films of note to screen include: A MAN IN A HURRY, from director Hervé Mimran and starring Fabrice Luchini and Leila Bekhti (Gaumont); BAYOU CAVIAR, which marks Cuba Gooding Jr.’s writer-director debut and stars Famke Janssen; CELEBRATION, a documentary on Yves Saint Laurent from director Oliver Meyrou (Playtime); HOLY LANDS, from writer/director Amanda Sthers and starring James Caan and Tom Hollander (STUDIOCANAL); HOT AIR, from director Frank Coraci and starring Steve Coogan and Neve Campbell (Great Point Media); JT, from writer/director Justin Kelly and starring Kristen Stewart, Laura Dern, and Diane Kruger (Fortitude International); LORO, from director Paolo Sorrentino and starring Toni Servillo, Elena Sofia Ricci, and Riccardo Scamarcio (Pathé International); MASTER Z: THE IP MAN LEGACY, from director Yuen Woo-Ping and starring Michelle Yeoh and Jin Zhang (Mandarin Motion Pictures); MY MASTERPIECE, from director Gaston Duprat and starring Guillermo Francella and Luis Brandoni (Latido Films); NOMIS, from writer/director David Raymond and starring Ben Kingsley and Stanley Tucci (Fortitude International); ROSIE, from director Paddy Breathnach and starring Sarah Greene and Moe Dunford (Protagonist Pictures); SAINT JUDY, from director Sean Hanish and starring Michelle Monaghan and Common (Blue Fox Entertainment); TELL IT TO THE BEES, from director Annabel Jankel and starring Anna Paquin and Holliday Grainger (Film Constellation); THE DEATH & LIFE OF JOHN F. DONOVAN, from director Xavier Dolan and starring Kit Harrington and Natalie Portman (Seville International); and THE PANAMA PAPERS, from director Alex Winter and narrated by Elijah Wood (Great Point Media) and THE PURITY OF VENGEANCE, from director Christoffer Boe and starring Nikolaj Lie Kaas (TrustNordisk). Among the slate of international films to screen are two candidates for the Academy Awards Foreign Language Nomination: Switzerland’s submission ELDORADO, from documentary filmmaker Markus Imhoof (Playtime); and Germany’s submission NEVER LOOK AWAY, from writer/director Florian Henckel von Donnersmarck and starring Tom Schilling, Paula Beer, and Sebastian Koch (Beta Cinema).